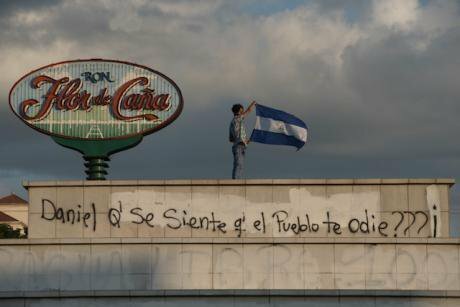 1st June, 2018, Managua, Nicaragua: A protestor holds up a Nicaraguan flag above a building during a spontaneous protest against the Ortega government. Carlos Herrera/DPA/PA images. All rights reserved. Since the 18th of April 2018, Nicaragua has been an unequal battle ground. The police have brought together groups of paramilitaries and vandals, who assault the local population. The police, with instructions from their supreme leader, José Daniel Ortega Saavedra, use war weapons, AK-47s and long-range rifles used by snipers. Nicaraguans find themselves in trenches and barricades of stones, trees, metallic waste, and paving stones among other things. They have stones in their hands and they launch metal mortars, also known as “cursed mortars”, homemade objects fashioned for launching heavy missiles. They also fire them with rope pumps (simple mechanisms used to pump water out from wells) of an artisan nature. Up until today, at least 127 young and unarmed people, mostly university students, have been murdered and approximately 1200 casualties have been reported. Society has rejected the presence of Señor Ortega Saavedra and his wife Murillo Zambrana and accuse them of crimes against a population who were protesting civically. Up until today, at least 127 young and unarmed people, mostly university students, have been murdered and approximately 1200 casualties have been reported. Señor Ortega has proclaimed in public that nobody will be leaving the country, to convey that his family will not be absconding any time soon. “Nicaragua belongs to us all and here we will all stay” he announced.. “Nicaragua isn’t private property of anybody. We are all the owners of Nicaragua, regardless of political beliefs, religion or ideology. God gave us this land, he gave all Nicaraguan families this land”. This show of strength gives him control of state institutions, however it does not grant him popular legitimacy. His speech appears promising, but in the case of Ortega and his wife, one thing is what they say and another is what they do. On that same day, they send their troops to shoot against women and children, murdering 15 young people and fatally injuring at least 100 people more. People assure that the fire came from armed men with experience in the use of weapons of war. Ortega and Murillo, a political pairing of president and vice-president, control all government institutions and they have developed a high concentration of power. Nicaragua possesses 4 powers; Legislative, Judicial, Electoral and Executive. Additionally, there are various de-centralised institutions; the Prosecutor, the Comptroller, the National Army, the police force, the Department of Revenues, Border Control, the regulating body for water and energy, and the Social Security Institute. All these institutions respond to two central commanders: Ortega/Murillo. Ortega and his circle have created a dictatorship. To that effect, he has taken over every national institution of the state. Judging by their political attitudes, Ortega and Murillo have gone mad with power, and they will resist letting it go, even if it means spilling more blood than has been spilt in this period throughout which (from the 18th April to the 5th June) at least 127 were murdered, and more than 1000 injured. Meanwhile this occurs, there is no authority or body in Nicaragua that is able to exercise its influence over the ruling family. And although there is always the National Army, they have appeared indifferent so far, and have shown their desire to remain on the margins of the conflict. Ortega and his circle have created a dictatorship. To that effect, he has taken over every national institution of the state. The word Ortega is law on every level of public administration. There is no rule of law, the courts are corrupt proceedings dealt from the home of Ortega/Murillo. There are evictions from property, land grabs, without anyone consulting the law, and all by force. He has created a perverse relationship with politics, to serve his personal interests whilst the population is ignored. He is shielded by 460 police officers. What’s more, Ortega/Murillo received a financial donation from the now deceased Venezuelan leader Hugo Chávez (an amount of approximately 3.7 thousand million dollars), and they did not deposit this into the central credit union of the country. On the contrary, they managed it discreetly and how they pleased. This allowed the pair to enter into the world of business more easily, where they achieved a cover-up for their despotism and violations of human rights. The conflict in Nicaragua is political. In 11 years (2007/18), the Ortega/Morales, Ortega/Hallesleven and the Ortega/Murillo administrations have abused and have committed constant violations of the constitution. They disdain society and practice politics accordingly. Their partners of choice came from entrepreneurial sectors who were gathered together under the High Commission of Private Enterprise (COSEP). However, this commission has no leadership that would allow it to make political decisions, and its objective is to achieve a return to normality pre 18th of April without taking any risk. Within the entrepreneurial classes, two levels exist: the first is made up of five extremely wealthy families, and the second, by a large amount of wealthy farmers and entrepreneurs that contribute to the agro exporting economic model of Nicaragua. The entrepreneurs are ideologically traditional, and have failed to promote any other economic model given that they are very satisfied with the profits they gain under the current system. Mainly because the cost of production is based on natural resources and the environment whilst labour costs and taxation are low. They also benefit from a system of preferential pricing and an example of this is sugar: in Nicaragua, the quintal of sugar is three times more expensive than the price that is traded on the international market. The great Ortega businessmen have gained exaggerated profits whilst the government have given them tax breaks as a present in exchange for their indifference over violations of human rights and the rule of law. It could be said that the government of Ortega today is a government of the extremely wealthy. The chief of the organisation admits that private business failed to calculate the grave error that was supporting such an abusive regime. The poor, who make up 70% of the population, are plagued with issues such as unemployment, and only the most faithful to the regime receive rewards within a framework of institutional populism. José Adán Aguerrí received the publication El País in the headquarters of COSEP in Managua and in an interview he stated that “we businessmen got it wrong with Daniel Ortega”. The chief of the organisation admits that private business failed to calculate the grave error that was supporting such an abusive regime. “If I had known that the result of this process was what occurred after the 18th of April, I would have never followed this path. Ever.” Now the businessmen are ordering a peaceful departure of Ortega/Murillo and elections as soon as possible. Will the loss of entrepreneurial support sufficiently weaken the regime until it falls? It is tricky to predict. During many years, Nicaraguan society has had to cope with constant human rights violations and now we are seeing a reaction against the extreme brutality of the Ortega regime. Nicaragua today is confronted with constant deaths, crimes and human rights violations, but how long can this go on for?